In 1648 the Cossacks rebelled again. This time they had a leader equal to the task in Chmielniecki. 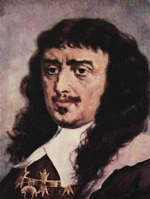 On news of the disturbances in the Sich Polish commander Nicholas Potocki set out for the Ukraine and in February 1648 he camped at Korsun. He sent part of his force (3-3,500) comprising regular troops and registered Cossacks to meet Chmielniecki (10,000), which they did at Zlote Wody (Yellow Waters). For the first time the Cossacks had allied themselves with the Tartars and together they formed a formidable fighting force. 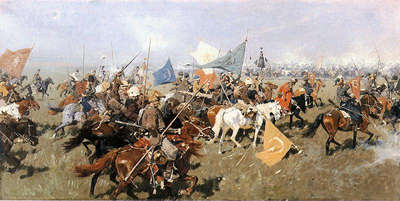 The mainly Cossack infantry now had a superb mobile cavalry arm while the solely cavalry Tartars had the assistance of the Cossacks defensive firepower. The Poles on the other hand lacked a commander of the stature of the recently deceased Koniecpolski. At Zlote Wody the registered Cossacks deserted the Royal army and in the ensuing confusion the remaining forces were destroyed on 15th May 1648. Eleven days later the main Polish army was defeated at Korsun and as news spread of these victories the whole of the Ukraine rose in rebellion. When he was most needed, the much respected, King Wladyslaw IV died and with the Royal commanders captured or killed Poland was without a leader. Fortunately for Poland Chmielniecki delayed while he organised his forces and his country, while the booty laden Tartars returned home. In September 1648 Chmielniecki moved further into Poland. With both Hetman's Potocki and Kalinowski captured, the Polish forces, though substantial, were ill disciplined and badly led by a group of three and defeated at Pilawce (10 to 23 October 1648). The improvised cavalry failed to make any impression on the masses of Cossack infantry supported by the skillful Tartars. The few regular infantry which had survived Zlote Wody and Korsun (King's guard regiment and 'Wybraniecka' infantry) did however acquit themselves well, defending the river crossings with great courage before being overwhelmed. It was a great material and morale catastrophe, and a pathetic military display. One Cossack commander noted "these were not the Poles we knew, the victors over the Turks and Muscovites, of Tartars and Germans, but cowards and rabbits, children clad in steel. They died of fright when they saw us". Chmielniecki then besieged Lvov and after receiving a ransom moved on to Zamosc, but the impregnable fortress held and the Cossacks returned home for the winter. Large numbers of peasants joined the Cossack army and with the Tartars they ravaged the land 'with fire and sword' slaughtering nobles, Polish or Ruthenian, priests and nuns and Jews in their thousands. The Tartars taught their Cossack allies many lessons in cruelty including the Moldavian custom of impaling alive, which was carried out with relish by Cossacks and Poles alike. No one was in control on either side and the whole region degenerated into mindless violence and cruelty. The coronation Sejm of 1649 enlarged the standing army, placing its financing partly on provinces of Poland and ended the registering of Cossacks. In June 1649 the Cossacks recommenced military operations when their Tartar allies returned. Polish forces retreated to the fortified camp of Zbaraz (10 July to 25 August 1649) where a relatively small force of some 9,000 Polish troops held back the entire might of Chmielniecki and the Khan for over six weeks. 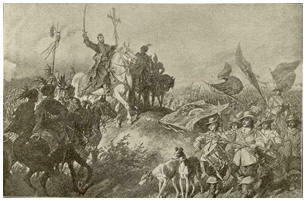 The new king moved to assist but was met by Chmielniecki's main forces in a hard and indecisive two day battle at Zborow (15-16 August 1649). The Poles succeeded in buying off the Khan and with Lithuanian forces operating in the East a truce was reached which included a general amnesty. Chmielniecki spent the next year maintaining the peace while making preparations for the inevitable continuation of war. He managed to raise an army of over 100,000 Cossacks had political support from Turkey and military support from the Crimean Tartars. He also hoped his rebellion, which had taken over the Ukraine, would spread to the peasants in Poland. The Sejm agreed to the raising of a 36,000 Royal and 15,000 Lithuanian army, giving the King the authority to raise the levy. While Polish forces were concentrating Hetman Kalinowski managed to loose half of his 12,000 force in operations to shield the main army. 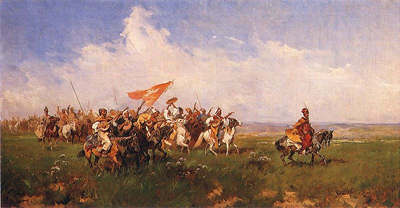 In June 1651 the Khan Islam Giereja rejoined the Cossacks and together they marched at the Polish forces. At the three day battle of Beresteczko (28 to 30 June 1651) the Royal army (27,000 mercenaries and 30,000 noble levy) achieved a decisive victory and the Cossack-Tartar army (60-80,000 Cossacks and 20-30,000 Tartars) retreated back to the Dniepr. Again the noble levy cavalry showed their poor discipline with the infantry saving the day and then ensuring a decisive defeat was inflicted on the enemy. After the battle the noble levy, deciding their duty was completed, dispersed while the remaining forces moved towards the Ukraine and joined up with the equally victorious Lithuanian army. Hetman Kalinowski, with complete victory within his grasp agreed to a truce. Peace was agreed in September at Biala Cerkiew, however it was even less successful than that agreed at Zborow. The Poles carried out punitive expeditions against the Ukraine while Chmielniecki punished with death the leaders of peasant riots. 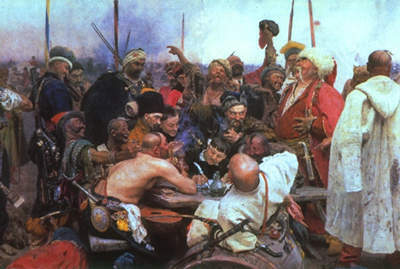 In 1652 the Great Cossack Council renewed hostilities with Poland and sent envoys to the Tsar and Khan for assistance. On 2 June 1652 Hetman Kalinowski attempted to head off Chmielniecki's move to Moldavia but was defeated at Batoh. After the battle the Cossacks paid the Tartars to give them their share of the prisoners so that they could be killed, amoungst the dead was the brother of the future King Jan Sobieski, Marek. 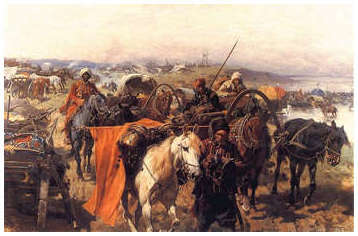 After a short vain siege of Kamieniec Podolski the Cossack-Tartar army returned home to seek further allies. Batoh led to a new 36,000 army with a much-reorganised financial base, making forces easier to raise and maintain, the Kwarta tax was used to maintain the artillery and fortifications. New financing gave the name 'computed' for the regular army. The noble levy remained as a last resort and there were periodic mobilisations and exercises. Although the new system was by no means perfect it gave the Commonwealth a powerful army and was a natural evolution from a mainly mercenary to standing army. The Cossack wars continued and on 18th January 1654 Chmielniecki submitted the Ukraine to the 'Tsars hand' and Muscovy invaded Poland and Lithuania. This was in violation of the Treaty of 1634 and Jan Kazimierz sent deputations to the Sultan and the Khan for assistance against the Tsar. The Ottomans allowed a Tartar alliance with the Poles, while the Sejm of June 1654 raised noble levies of 35,000 for Poland and 18,000 for Lithuania. The Muscovite army attacked with three groups at Lithuania and one at the Ukraine. The Muscovite army was numerous and well equipped and now trained mainly in the Western manner with many foreign officers. In Lithuania they were briefly checked by Janusz Radziwill's small force, before pushing on to Smolensk. The winter halted further operations. In the Ukraine the Polish-Tartar army met the Cossack-Muscovite army at Ochmatow (January 1655) and though the Muscovite forces were broken a decisive result slipped from the Poles when the Tartars refused to fight the Cossacks. In the Summer of 1655 a new Muscovite army reached Wilno and in two weeks turned the vibrant capital into a heap of ashes, but another even more dangerous enemy appeared.